The status of the post Affordable Care Act landscape, including the fate of the American Health Care Act and the Better Care Reconciliation Act, remains uncertain. Nevertheless, continuation of recent years’ overall healthcare trends seems assured. Guided by public policy, downward pressure on payments and resultant revenues will continue. Alternative payment schemes will be pursued with an emphasis on increasing risk distribution. Emphasis on greater efficiency and, ultimately, cost reduction will increase. In addition, control of labor costs through productivity optimization will continue to be a major focus. These trends are particularly acute in the inpatient setting, which is increasingly viewed as a cost center. In the context of this environment, we describe a novel approach to the identification, analysis, and improvement of acute care processes, resulting in significant enhancement of operating efficiencies and quantifiable cost reductions ranging from 5% to 100% of baseline across 12 specific domains. Led by the regional Chief Medical Officer (CMO) Dr. Richard Carvolth and Physician Advisor for Utilization Management (UM) Dr. Alvin Gore, Santa Rosa Memorial Hospital (SRMH) formed an executive sponsor team that included key stakeholder representation from nursing, pharmacy, ancillary, and medical staff. While recognizing the value of many traditional UM processes, including labor productivity, staffing ratios, bed type assignments, throughput initiatives, and supply chain management, the team’s goal was to find new opportunities for improved resource management in bedside care delivery. The project was carried out in the Northern California region of St. Joseph Health System, a not-for-profit integrated Catholic healthcare delivery system with acute care hospitals, home health agencies, hospice care, outpatient services, skilled nursing facilities, community clinics, and physician groups in Northern and Southern California, as well as Western Texas. The two participating hospitals, described below, are in close proximity to each other and share executive oversight, enabling unified project implementation and supervision. SRMH, a 338-bed, Level II trauma and medical referring center, is the larger of the two facilities. SRMH serves a wide geographic area north of the San Francisco Bay Area, with a population base of approximately 1.5 million and 45,000 ED visits annually. In addition to trauma services, SRMH provides hospital services including orthopedics, cancer care, cardiovascular and neurologic surgery, and general medicine inpatient service. It also has a Level II NICU and a Heart and Vascular Institute. The project also included an affiliated smaller community hospital, Petaluma Valley Hospital, an 80-bed facility with a family birthing center and 16,000 ED visits annually. The primary methodology was a modified Lean approach with rapid-cycle process improvement. Rigorous data management, led by a dedicated analyst, allowed for close outcome tracking and course correction, in many cases as frequently as daily. Reporting to the executive management team occurred quarterly over the course of the project, and appropriate results were incorporated into the budget process. Beginning with a pilot project in fiscal year 2014, the program was considered mature by fiscal year 2015 and was included in that year’s performance accountability for the UM department. It was fully incorporated into the budget for fiscal year 2016, and plans to extend the program regionally for 2018 are underway. We wanted a structure that could bridge traditional hospital departments and unify stakeholders around targeted themes, or projects, for shared improvements. We formed a separate, dedicated committee—the Utilization Management Steering Committee—that serves an administrative function and is separate from the Joint Commission UM committee, which continued to function at each site. We developed a clear charter and populated the membership as follows: the regional CMO (chair), regional physician advisor (vice chair), medical director for population health, director of case management, regional director of finance, regional director of pharmacy, and a dedicated UM data analyst. High-cost areas of the hospital, such as pharmacy and drug utilization. High-volume or high-frequency processes, such as laboratory utilization. Labor-intensive sections of the hospital related to level of care, such as telemetry and ICU utilization. Throughput and process failure, such as high length of stay and readmissions. Issues related to appropriate level of care, such as ED acuity, super utilizers, and ICU admissions. Reductions in harm, such as transfusion safety and imaging reduction. As specific focus areas developed, project owners were identified, typically selected from department directors such as nursing, pharmacy, and imaging. Whenever feasible, a dyad model was utilized, pairing a clinical leader with an administrative staff member in order to maintain an integrated and comprehensive approach. After identifying specific initiatives (projects), project owners were asked to conduct and communicate a gap analysis to identify the barriers to efficiency in the department or service line. Upon identifying and quantifying the efficiency gaps, the project owners worked with the members of the UM steering committee as well as other knowledge leaders within affected departments to establish and codify actionable items to close the gaps and achieve the stated goals (identified below). Projects were studied concurrently to establish baseline conditions and quantifiable metrics that could be used to determine specific goals and financial results, as well as to communicate relevant reporting statistics back to the committee and project owners. The UM data analyst gathered enough historical data to achieve statistical significance. This data could include system-generated information regarding lengths of stay, actual purchase data from vendors such as units of blood product, or data gathered directly from the hospital staff such as the census counts of telemetry patients. We felt that suitable metrics should be selected based on ability to be translated into financial results, understanding of what is being measured by the consumers of the information, ease of data gathering, and accuracy. A specific example of data gathering and metric selection is the use of Amalga to examine Medicare inpatients’ length of stay by comparison to Milliman Care Guidelines based on diagnosis-related group (DRG). Of course, hospital operations are in constant flux; however, the baseline state and any metrics, once determined, remained subject to review and ongoing assessment. Our process involved both statistical input as well as the clinical expertise of the committee and project owners. We felt that the goals identified, and ongoing review, should represent a realistic outcome rather than an ideal state that might seem unattainable to project owners. We invited project owners to a kickoff meeting, where their planned project was discussed and final goals and metrics were established. It was important for the project owners to focus on clinical processes and their impacts, allowing these improvements to drive the financial outcomes. Following the kickoff, we continually monitored the progress of each initiative for follow-through on actionable gap-closure measures as well as tracking of financial progress. We created two dashboards for progress tracking and trending. All of the projects were assembled into a master dashboard designed to track the progress of each individual action plan, as well as the progress toward the goals of each project in aggregate. This dashboard does not track the month-to-month modeled financial results of the project, but rather the progress toward established goals and specific outlined actionable items. For an example dashboard, please refer to Figure 1. * Please note that all targets and financial data are estimated and fictitious, and do not represent the actual operations of the facilities. A separate dashboard was created to track the ongoing financial impact of each individual project. These results are referred to as modeled, as the projects’ financial results are often based on generalizations regarding costs, time, or efficiency, and not actual “hard dollar” results. As each of the projects has a different set of metrics, this dashboard is not standardized in the same manner as the goal tracking dashboard. 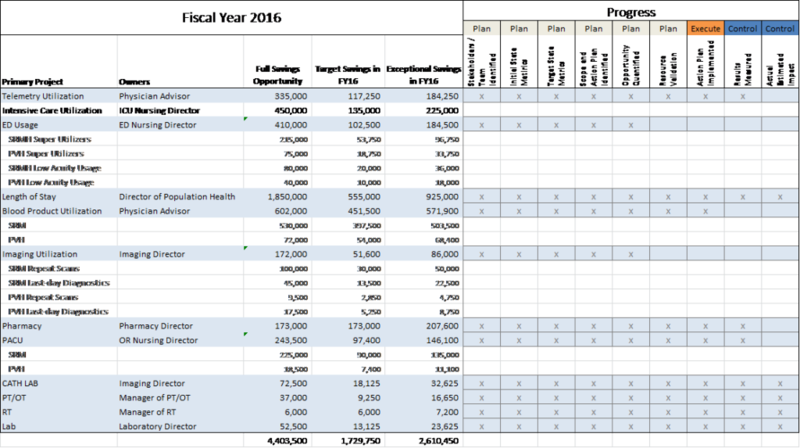 Rather, it represents a single summary page with separate line items for each project’s results on a month-to-month basis. 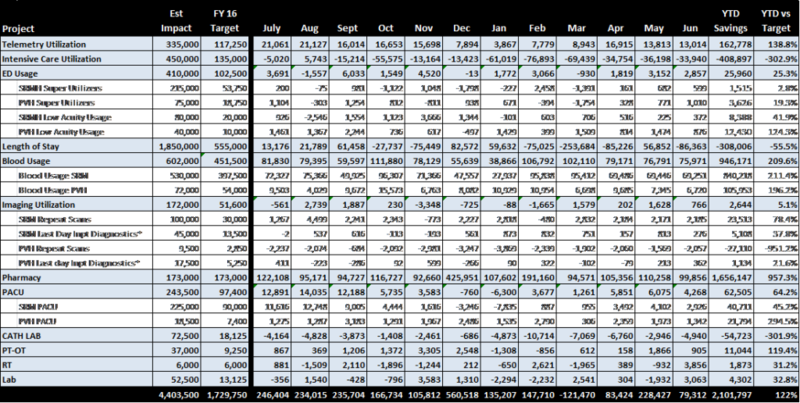 The individual results for each project are calculated elsewhere and aggregated on the dashboard. The summary tracks the progress of the metric, the modeled financial impact, as well as the financial progress toward the overall savings goals. For an example dashboard, please refer to Figure 2. In addition to ongoing feedback to project owners, quarterly review meetings were held where each of the project managers were invited to discuss their progress with their peers and the UM steering committee. These forums have been an excellent opportunity to uncover or discuss new topics in UM. Annually, all of the projects are evaluated for effectiveness and new targets and goals are set by the UM steering committee. To Illustrate our program, two focus areas are described below. We estimated that eight to 10 patients per day remained on telemetry status who could have been assigned to a medical-surgical unit based on certain criteria. Through gap analysis, we identified the root causes of these misplacements as provider culture, lack of evidence-based order sets, and guidelines for appropriate telemetry admission. Inappropriate use of telemetry also had throughput ramifications on length of stay. Further, California regulations mandate 1:4 nursing ratios on telemetry units versus 1:5 ratios for medical-surgical units, carrying efficiency and cost implications. The goal of this initiative was to reduce misplaced patients in telemetry units below a baseline of eight patients per day. The physician advisor and nurse manager of the telemetry unit were the owners of the initiative. Several approaches were utilized to accomplish this target. First, a hospitalwide educational effort regarding the appropriate use of telemetry was conducted with the medical and nursing staffs, with a focus on hospitalists, cardiologists, internal medicine, and family medicine physicians. In parallel, a new telemetry order set, based on evidence-based national recommendations, was formulated and approved by relevant medical staff and administrative committees. Second, the physician advisor began attending daily multidisciplinary huddles on telemetry units with the specific purpose of culture change. As awareness, acceptance, and adoption developed, outcomes improved. 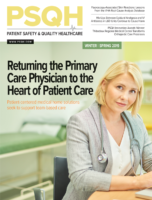 In the most recent fiscal year, the metric has held steady at an average of four misplaced patients, a significant improvement from the baseline state. 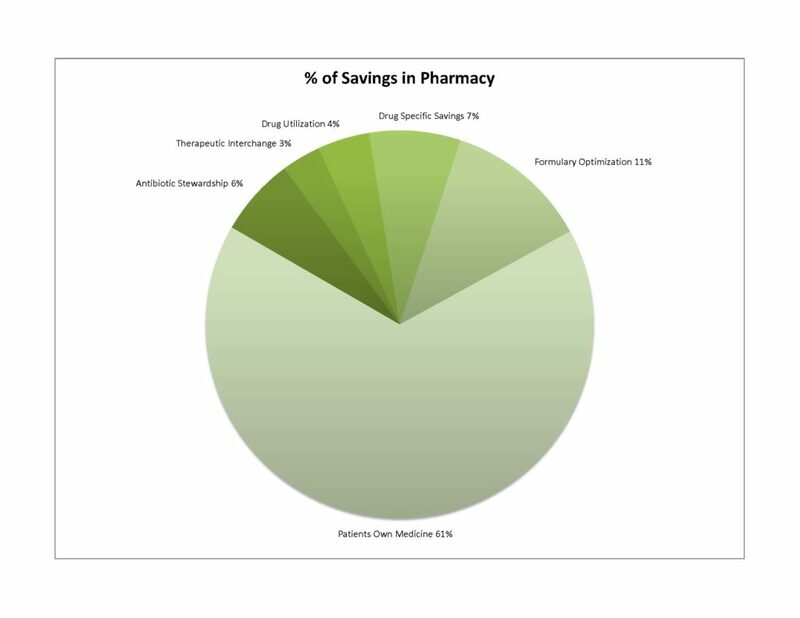 We estimated over $1 million in full savings opportunity for pharmacy-related improvements. We identified six areas for improvement: IV-to-PO conversion therapy; antibiotic stewardship; therapeutic medication interchange; treatment optimization and drug utilization; formulary optimization, especially oncology; and use of patients’ home medications. A detailed analysis, opportunity calculation, and implementation strategy were developed for each of these targeted areas. Results are displayed below. We designed and implemented a comprehensive, collaborative, stakeholder-driven approach to clinical efficiency and cost-effectiveness across a broad spectrum of typical community hospital operational units. Our results were financially significant, but—just as importantly—our process created a new level of awareness for operational personnel. In addition, the results created a culture of consciousness of continuous improvement opportunities in care delivery efficiency and waste elimination, as well as a structure and mechanism to convert ideas into process changes, outcomes, and savings. We are confident that our approach is translatable to virtually any community hospital of any size and scalable to virtually any region or system. Richard Carvolth, MD, MMM, FACEP, is the chief physician executive for the Sacramento Region of Dignity Health, a six-hospital integrated delivery network serving the greater Sacramento and Northern California area. Alvin Gore, MD, CHCQM, is the medical director for utilization management at two hospitals for St. Joseph Health in Northern California. Kevin Dombek is the regional utilization management analyst for St. Joseph Health in Northern California. Matthew Rogers is the manager of financial planning and analysis for St. Joseph Health in Northern California.